Display Advertising, one of the most useful instruments for PPC specialists in the SEMrush toolkit, now has expanded functionality. It is time to dig deeper into your competitor’s advertising campaign with the brand new Ad Report! The Ad Report allows you to track each of your competitor’s ads in detail and view the exact advertising placement on which it is located in one click. If you’re ready to dive into ad research, let’s look at a real-world example. Let’s say you want to know one particular ad of the Ford advertising campaign inside and out. Go to the Ads tab in Display Advertising, and scroll down until you find an ad you’d like to learn more about. Then click on the ad field, and here comes the Ad Report. What information can you discover with the Ad Report? 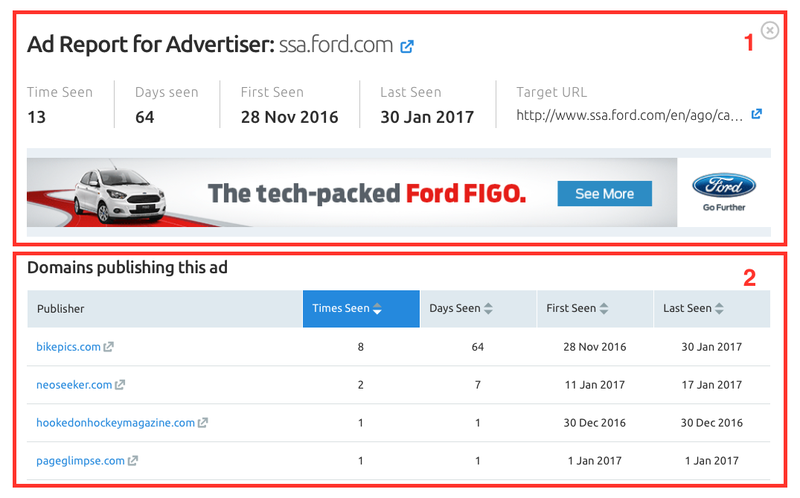 At the top of the report, you can find data on how many times and when SEMrush saw the ad, and view its target URL as well as the ad itself (1). Below you will find a list of domains that published this ad with related information on its publication (2). The good news is that you can sort it by any of these filter options: times seen, days seen, first seen, and last seen. Now you have data on the Ford ad’s publishers. It is time to analyze it and think about a possible list of advertising placements for your own ads! [email protected]. Thank you for making SEMrush better!